Not all saddlers made collars. It was a specialised job. All saddlers had to be able to mend collars though, because without a good collar, a horse's working power was severely limited. A horse pushes all his weight into the collar to shift a load (yes, horses push carts, they do not pull them!) If the collar does not fit, he has problems. If it is too short, he cannot breathe properly, while if it is either too narrow or too loose his neck or shoulders soon become rubbed and sore and then he has to be off work until they heal. Collars are stuffed with rye straw, which is very long, fine and hard wearing, inside a heavy felt facing which sat nearest the horse. Over this felt layer was an inner lining which on heavy work collars was usually of checked woollen serge. This often wore into holes and had to be patched, carefully, so that there were no proud spots to cause rubs. Later, the area on the outside under the trace tugs would wear and have to be reinforced with new leather. A heavy horse collar that reaches this stage has had its day. You can see the wreckage of the straw body which stiffened and padded the entire structure. To see how rye straw is still reaped for collar-making, see the Weald Museum site. This pony collar has seen better days, but has been carefully mended over its many years of use. A good collar would last fifty years or more with good maintenance. When the top "cap" eventually wore out, a thrifty owner would bring the collar to the saddler's shop to have it mended like this with a strap and buckle. Move your mouse over the picture to see where the cap was. The collar, although smaller, then became adjustable to different horses' necks, and could be used on a young one who had not yet become used to having the collar put over his head in the normal way. A final use for a nearly-dead collar is to be used in "gurning" contests. Gurning is a traditional event dating back over 700 years. Competitors have to put their heads through a horse collar and the person who then pulls the most grotesque face is the winner. The World Gurning Championship is held annually at the Egremont Crab Fair. Other much smaller local contests have been held in recent years in villages such as Orton and Tebay. Judging by the winners' qualities (Morland Sanderson and David Trotter to name only two), it helps to have removable teeth, crossable eyes and a face made flexible by years of use. One collar the saddler's skill would definitely not be needed for was this one: the patent steel collar. Left: Front view of the collar. 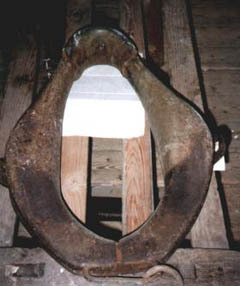 It was probably one of a pair, as shown by the "kidney link and ring" at the bottom edge which would connect a pole chain to a central pole on a vehicle or an implement designed for two horses. The inner side bears on the horse's neck and shoulders. "Cure and Prevent Sore Shoulders. "These collars were awarded Prize Medals at Paris 1889; Staffordshire Agricultural Society's Show, 1890; Birkenhead Agricultural Society, 1890; Altrincham Agricultural Society, 1890; and Prague Exhibition, 1981. They also received a Diploma of Merit at the Royal Military Exhibition, Chelsea, 1890. "In ordering, give inside length and inside width in widest parts of Collars now in use, and say what draught attachments are required. "Draught ring for traces; Draught hook for chains; Ring and hook attachment for team work." The advertisement for "Patent Elastic Steel Horse Collars" claims that they "Cure and Prevent Sore Shoulders", and emphasises that there was "no drying required" after use. The collar in the photograph above has the "draught hooks for chains" option. The collar is heavier than a leather and straw bodied collar. The arguments in its favour were that it covered less of the shoulder than the traditional construction and so was cooler; it was more easily cleaned of sweat, and needed no drying for the next day's work; it could be put over the neck of a horse directly, since it split at the bottom, and did not need lifting high and pushing over the horse's head upside-down and then twisting round into place, as the traditional collar did. It was certainly more durable. 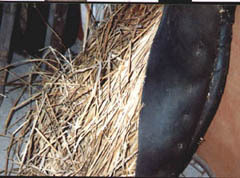 This example has been used, as can be seen by the sweat marks on the inside, so at least one man was convinced of its usefulness, but whether it really was more comfortable for the horse is debatable. One of the main advantages of the straw collar is that it shapes itself to the neck as it is used, which this collar cannot do. He adds that "Many wagoners used these collars whenever a horse developed sore shoulders. One would be found in most stables, kept for this purpose. In Herefordshire they were used regularly in the hopfield, especially when the hop binds had grown, and working between the rows was a hot and sticky job. The metal collar kept the shoulders cool. The Kent growers, however, preferred to keep to the ordinary padded collar." Perhaps the most surprising thing in this advertisement is that Birkenhead, now almost entirely built up as a suburb of Liverpool and famous mainly for shipbuilding and Tranmere Rovers football club, should in 1890 have had an Agricultural Society whose prize medal was thought worthy of mention.